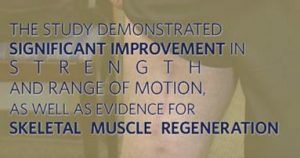 Results of a study conducted by researchers at the University of Pittsburgh School of Medicine and the McGowan Institute for Regenerative Medicine showed significant improvement in strength and range of motion, as well as evidence for skeletal muscle regeneration, in 13 patients who were surgically implanted with bioscaffolds derived from pig tissue to treat muscle injuries. The patients had failed to respond to conventional treatment before use of the extracellular matrix (ECM). The findings were published online in npj Regenerative Medicine. The project was supported by a research grant from the U.S. Department of the Interior, grant D11AC00006.